This is my third book sponsored by Blogadda for review. And I was beaming radiantly like a baby does. I skimmed through the pages. Felt happy seeing the names of Shahrukh Khan, QSQT, Kuch Kuch Hota Hai, DDLJ and so on. After all, I have grown up watching these films. I could not wait to read the book. As I read the book and closed it foir one last time after completing it… This is what I felt like!!! Indian movies have gone through a metamorphosis. Some movies have been cult enough that they are remembered even today. Some have been such a disaster that people try to forget on the very day of release. Some filmmakers have been trend setters and some have been trend breakers. Some actors created a niche of their own while others were happy following the crowd. Some were bold and some were not. Some were critically acclaimed and some were the King of box office. Some were never tiered of failure and rose against all the odds; while some tried hard but never succeeded. Some were backed by family names and some came like a storm from nowhere and reigned the film Dynasty and the box office. Some star kids shone and some never returned from the dark. Some songs made us hum and some made us dance. Some songs brought tears and some made us happy. Some songs became anthems and some became exceptional. Some singers gave soul to the song and some bagged sacks of awards. Some characters in the movies were so real like you and me and some were too dramatic and out of the World. Some heroines looked like Goddess while dancing in a clingy sari and some heroes fought like a warrior. Some cine ma never stood against the wishes of their children and some went against them if they were the wrong doers. Some filmy fathers were dead from the opening of the film and some were killed eventually. Some were identical twins and some shared sibling relationships with animals. Some sisters were always harassed by the villain and some were always the iris of their big brothers. Some villains were always menacing and some were silent killers. 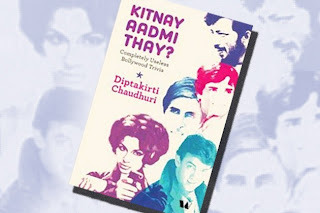 Well… If you want to know who were those and which movies I am talking about… then you have to pick the book titled “Kitnay aadmi thay” by Diptakirti Chaudhuri. The books exceptionally talks about Bollywood films and its journey. The author has put lots of research and has narrated his findings in a very interesting way. While most of the points he has mentioned is the obvious, it brings a smile of recognition. At times it turns us nostalgic. I liked the way in which the contents are arranged. It is arranged like a movie per se from the titles to credits. I especially loved the footnotes. It fills the hunger of a movie buff. It fills his appetite of knowing more and everything. 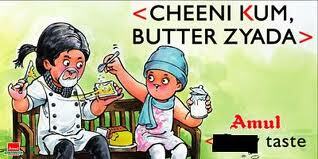 The author’s insanity when it comes to bollywood can be easily smelt as he details about the association of Amul butter with Bollywoood. He has put loads of research into it. I genuinely wish that the author also acknowledged the magnanimous non-bollywood stars too. The author indeed mentioned those actors who tried hard to create waves in the north and failed utterly. But, I wish that he threw light all others too. Hey! Aamir Khan had eight packs in Gajini and not six packs. The author has mentioned that twice. It is an apparent misstatement and I wish that the author was more careful. And the author talked about Aamir Khan extensively. But, he did not mention about the other two Khans. So much was mentioned about Amitab Bhachan; but, nothing much about other stars of golden age. Well, it is a small book with about 300 pages. We cannot expect much either. Bollywood is an ocean in itself. There is a story behind every story, actors and technicians. Some stories have Bollywood style of endings – happy endings – and some don’t. What I liked about the book is its genuineness. It is simple and straight from the never shutting mouth of a movie buff. It is more like a proud Bollywood follower’s ramblings than a trivia. If you are an ardent follower yourself, like I am, I bet that you won’t regret for grabbing the book. And, if you are not a movie buff, better get hold of this book and be a part of the great Indian Cinema. To edit is crisp, it is a straight from heart attempt by the debutant author. It is gripping from the titles to the credits. There are songs… drama… comedy… action… sentiments… dancing heroines… acting heroines…. Action heroes… Passion heroes… and what not!! Go for the book… Feel nostalgic… feel proud as you read something that you have already noticed. And… tap your head as you realize that you failed to notice the apparent! This review is a part of the Book review program of Blogadda. Participate now to get free books! I really liked the way you ended the review.. " Go for the book… Feel nostalgic… feel proud as you read something that you have already noticed. And… tap your head as you realize that you failed to notice the apparent! " And Congrats on the prize.. Some lucky charm seems to have worked on you.. :P.. Keep up the good work!!! !